This title is no longer available from Tyndale, but it can be purchased through the William Carey Library at: www.missionbooks.org The New Testatment Greek Manuscript volumes were created especially for advanced students of the New Testament, Bible translators, and New Testament textual scholars. They enable the user to see at a glance any variations between the surviving Greek witnesses and any given verse in the four Gospels and Acts. The series is compiled and edited by New Testament scholar Reuben J. Swanson. Each volume presents all the known variants in Greek with the texts of the New Testament book in an easy-to-follow, verse-by-verse format. Each volume also includes a brief introduction to New Testament textual scholarship, along with helpful appendixes. 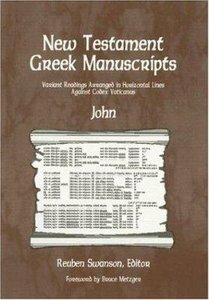 About "New Testament Greek Manuscripts: John"
Swanson is Emeritus Professor of Western Carolina University. He is a graduate of Gustavus Adolphus College and Augustana Theological Seminary. His S.T.M. and Ph.D. degrees in New Testament Studies are from Yale. He is an ordained pastor in the Evangelical Lutheran Church in America and has served parishes in Michigan, Connecticut, Iowa, North Carolina, and California.